And now for today’s recipe. Yesterday evening was the first serata piemontese, and it was a great success. Tonight is the next installment, with the same food but mostly different wines. I will do a full report in a later post. I included two primi piatti in my Piemontese menu: agnolotti and risotto al barolo con salsiccia. 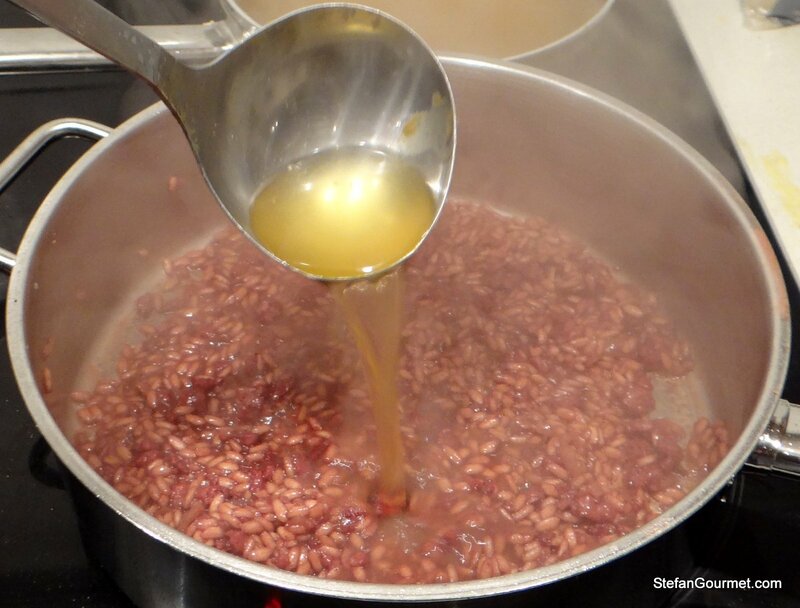 Risotto is usually made with just a bit of white wine, but Piemonte has the speciality of using red wine and quite a lot of it so the main flavor of the risotto is that of the wine. The end result will thus depend on the quality of the wine used, and though it may seem like a waste of a good barolo, I strongly urge you not to use a cheap red wine for this as that would ruin the dish. 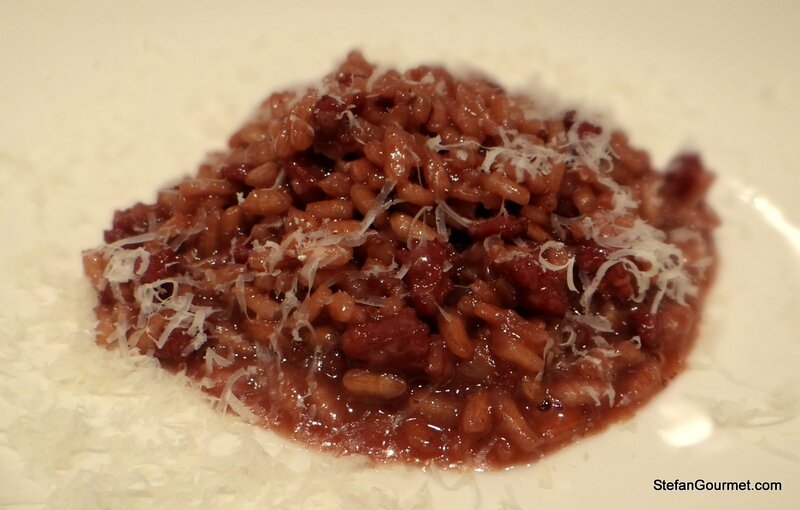 Last night everyone agreed that this risotto was different, but delicious. 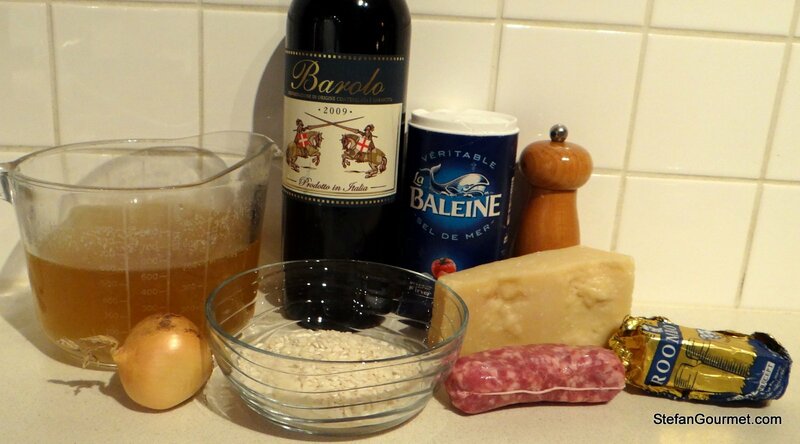 Instead of doing a risotto al barolo only, I decided to include some Italian pork sausage, salsiccia. 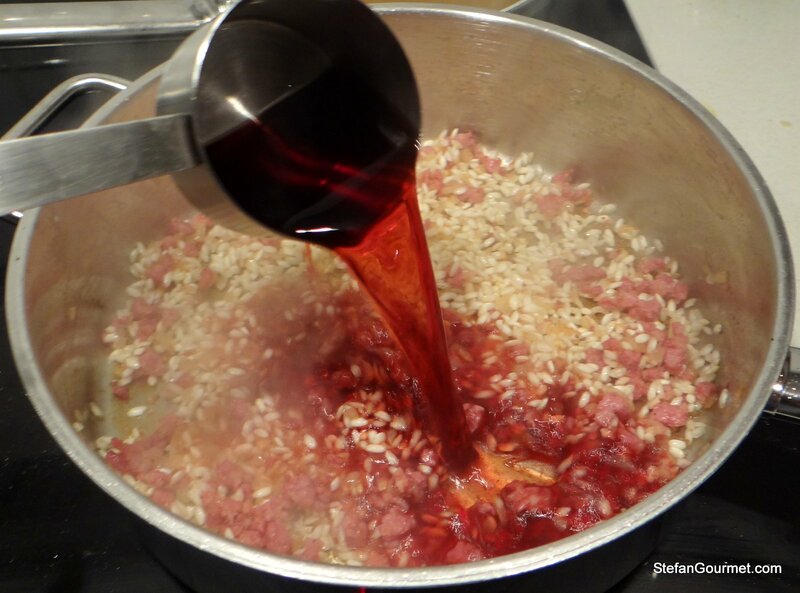 The wine makes the risotto quite astringent, and the meat helps to obtain a rounder flavor. For the meat stock I used the leftover stock from the agnolotti. It is not a problem at all that the agnolotti have released some starch into the stock — in fact, that only helps to bind the risotto. Mince the onion. Take the sausage out of it casing and mince the meat. 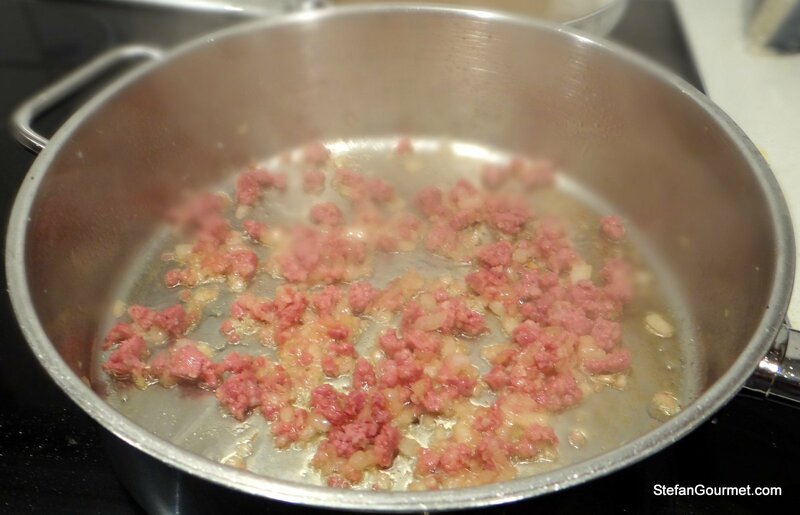 Melt 25 grams (2 Tbsp) of the butter and sauté the onion and the sausage until the onion is translucent and the meat has lost its raw pink color. Add the rice and toast it over medium heat until the edges are translucent. Add half the wine and stir until most of the wine has been absorbed. Add the remaining wine and stir until most of it has been absorbed. Now add meat stock by the ladle and keep stirring and adding more stock as needed until the rice is cooked but still has some bite (about 18 minutes from when you started adding the wine). When the rice is cooked (taste to test! ), add the remaining butter and half the parmigiano. Stir to incorporate. Taste and adjust the seasoning with salt and freshly ground black pepper. Allow to rest for a few minutes. Stir on warm plates, sprinkled with the remaining parmigiano. It goes without saying that a nebbiolo-based wine is the best pairing for this. An actual Barolo may be a bit heavy, but a Barbaresco or Roero or Nebbiolo d’Alba would be perfect. 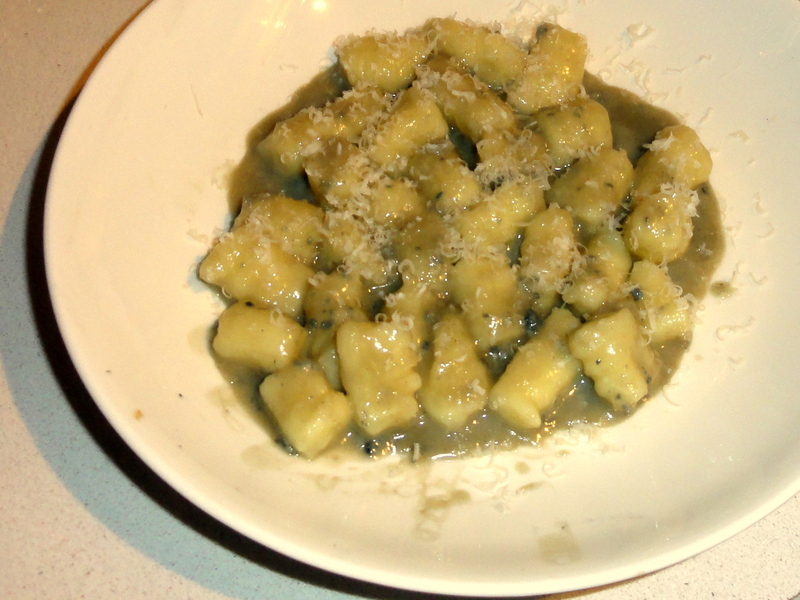 My first post on November 30, 2011 was a recipe for potato gnocchi with a gorgonzola sauce. Seeing the photo of the finished dish now makes me cringe a little, but I can assure you that it tastes a hell of a lot better than it looks. Fluffy pillowy potato gnocchi and a creamy pungent gorgonzola sauce are a great combination. Making your own potato gnocchi is not that hard, and you don’t need any special equipment for it (even though I like to cook my potatoes sous-vide for gnocchi, but oven roasting or simple boiling are fine as well). Happy ‘blog-day’ Stefan 🙂 Here’s to another two years! 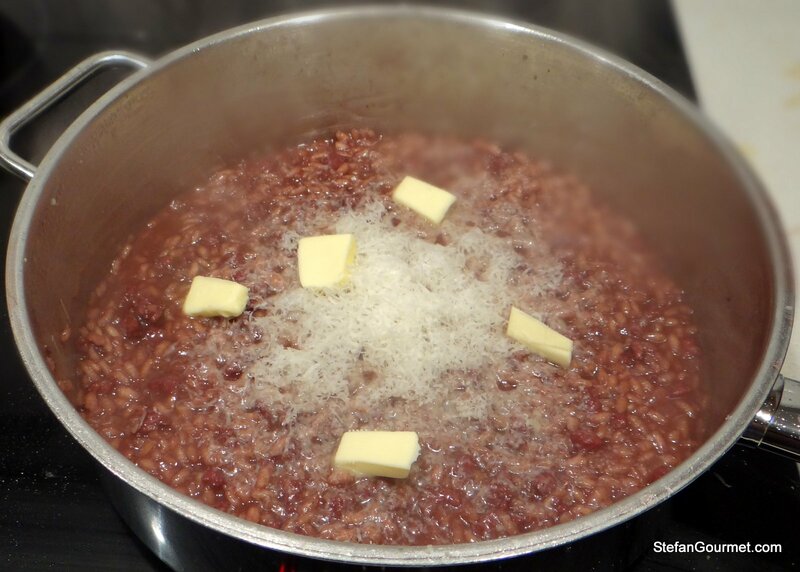 risotto al barolo una vera specialità. Lo adoro. Nice! And congrats on the he two years. Apart from the generally great food you are clearly one of the leading sous vide bloggers thee days, I am jealous of your chamber vac! Thanks, Owen. I don’t think I can start inviting all my readers to dinner, but if you’d like to meet up for drinks after work or something, let me know! congratulations on the second anniversary of your blog! I’ve learned quite a bit from reading you. Cheers Stefan! An achievement to which I shall add a loud clap! When I first saw ‘salsiccia’ I thought we were dealing with my very favouruie vegetable salsify. No – it was to be a pork sausga I did not know ~ shall try to learn!! Thanks, Eha. Salsify is “scorzonera” in Italian. Interesting that it is your favorite, as I find it quite hard to prepare in such a way that seems to be worth the trouble. It is known as “kitchen maid’s sorrow” in Holland because it stains one’s fingers so much when you peel them. [warm laughter!] Yes, well Stefan ~ when I fell in absolute and total love with it I was too small to cook ~ the staff kind’of ‘did it!’ But when I had the measles and the mumps etc et al and could actually ‘ask’ this is what I wanted!! Lord only knows why I ‘fell’ for all these oddities like ‘Black pudding’ family and funny snake-like fish and salsify!! But look it led me where I am today and such a lot of people are not 😀 !! Stefan, Congratulations on the 2nd anniversary of your blog! Flashback is a great idea to bring to us your masterpieces missed. Also, adding photos to your ‘Related’ section gets attention, I think. (Go to Setting > Reading > Related posts > click the third box). Thanks for the tip, Fae, I’ve just changed the setting. 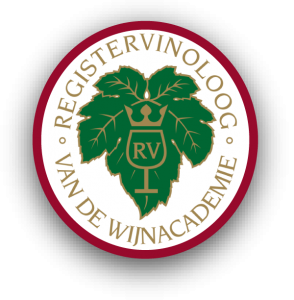 Hallo Stefan, ik vond je diner en de wijn heerlijk! En jij als gastheer geweldig! Marcel had ook erg genoten. Met je vrienden erbij en Kees natuurlijk, was het bovendien heel gezellig. Lieve groeten van Caroline. What a great wa to mark your anniversary, Stefan. Congratulations and I cannot wait to see what you’ve in store for us next year.